If you aren't familiar with mulch, it's a much more magical substance than the name suggests. The best types of mulch multitask, helping to regulate the temperature of the soil while keeping down weeds, improving water retention and making the yard look neat and tidy. These days, the many benefits of mulch are so well known that the question is no longer whether to mulch but which type of mulch to use. Here are popular mulch types and a discussion of their benefits and disadvantages. Organic mulch feeds the soil as it disintegrates. Mulch can be either organic or inorganic. Organic mulch is any substance used for mulch that has at one point been alive. It can be shredded dried leaves, straw, newspaper, wood chips, grass clippings or composted matter. Most organic mulch ultimately deteriorates into the soil, enriching it with nutrients. Homemade compost is a great example. On the other hand, you have to replace organic mulch regularly, and some types disintegrate fast. Inorganic mulch is made of a substance that has never been alive. It can be a layer of plastic paper, gravel or even sand. Anything a gardener spreads over garden areas between plants is being used as mulch. Inorganic mulch can be decorative in the garden. It lasts a long time without need for replacement but, unlike organic mulch, cannot be worked into the soil at the end of a season. Straw and hay are full of air, making a great mulch for controlling the soil temperature. Many gardeners use straw or hay to cover their vegetable gardens for this reason. It is also fairly inexpensive. Wheat and oat straw are a great consistency for mulch, but both contain seeds that must be removed before being used for mulch. Rice straw can be used immediately, without treatment. Alfalfa hay offers the same advantages of straw but packs more of a nitrogen punch as it disintegrates into the soil. But hay can contain weed seeds, making for unpleasant surprises in the spring. Chopped tree leaves, wood and bark make inexpensive, long-lasting organic mulch. Cypress mulch has long been popular because it is inexpensive. However, cypress are native wetland trees that filter pollutants from the water, and harvesting it for mulch can deplete its shrinking populations in the wild. Cypress mulch also tends to attract termites and keeps water from reaching plant roots. Cedar mulch, made from chopped cedar, smells good and lasts several years in the garden. It repels termites and other insects, including, unfortunately, beneficial insects. It can be more expensive than other wood mulches and also prevents water from getting through to plant roots. Mulch made from cedar bark can also leach nitrogen from the soil. Leaves that litter your backyard in autumn are yours for the taking and make excellent winter mulch. If you just tuck them into beds, they can mat and get slimy, so take the time to chop them first. Conifer needles work as well as other leaves, so rake up those that fall for free mulch. Pine needles interlock on the soil and don't blow away, plus they acidify the soil as they decompose. That makes them great for acid-loving plants like blueberries and hydrangeas and garden flowers like marigolds. Sprinkle them around the roots up to 3 inches deep. As long as you don't spray your lawn with pesticides, your grass clippings also make an excellent, free mulch. Spread the clippings thinly in vegetable beds, then work them into the soil at the end of the season. Don't add a thick layer or they will clump. They can also be returned to the lawn, where they provide nitrogen, potassium and phosphorus. 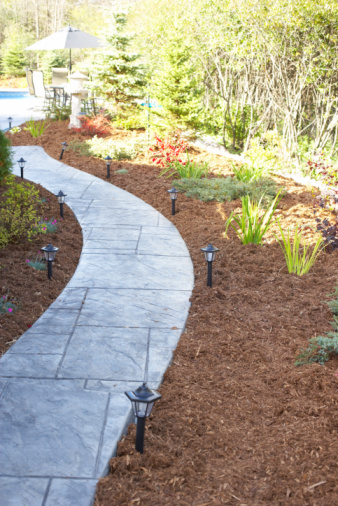 If you are looking for a long-lasting mulch that holds down the weeds and looks attractive, pea gravel or crushed rock might be a good choice. Acting as part mulch, part hardscape in your garden, gravel allows water to pass through to the soil below. That makes it acceptable as mulch around trees and shrubs, as well as garden walkways. On the other hand, when you are ready for a change, you'll need to rake it up and carry it out. It cannot be worked into the soil and provides no nutrients. Plastic polyethylene film comes in rolls at the garden store. Unrolled in your garden as mulch, it does a great job of killing weeds, but doesn't allow water to pass through. Unless you want to install irrigation below the plastic, it is not practical for general use in gardens. As an alternative, use landscape fabric that eliminates weeds but also allows water to seep through. It can be pricey though, and doesn't look that great on its own. Instead of leaving it plain, put a layer of wood chips on top. What Is Gorilla Hair Mulch? What Type of Mulch Is Safe to Use for a Child's Play Area? Is Mulch or Gravel Best to Put Under a Stairs or Deck?